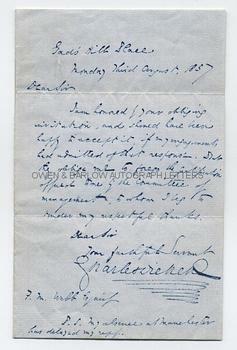 "Dear Sir, I am honoured by your obliging invitation, and should have been happy to accept it if my engagements had admitted of that response. But they oblige me to forego the gratification offered to me by the Committee of management, to whom I beg to tender my respectful thanks. Dear Sir, your faithful servant, CHARLES DICKENS. P.S. My absence at Manchester has delayed my reply". With good full signature. 8vo. Approx 7 x 4.5 inches. Hole in integral blank where it had been affixed into an album but this does not touch any part of the manuscript leaf. All else fine.